How Practical Are Tremolo Pedals? How To Choose The A Tremolo Pedal? When it comes to guitar effects, the selection we have today is far more than any guitarist could even imagine some 40 or 50 years ago. Just like it is the case with anything else, development of these tools took time. However, since everything has a start, it’s worth mentioning one of the oldest guitar effects in existence – the tremolo. It all started with amps that came with a built-in feature that would modulate the volume automatically. This created a very interesting effect, which was also among the only effects at the time. It wasn’t long before it became popular, and the first pedals started coming out which would allow the user to emulate this effect on any amp, including those which didn’t have this feature as standard. Today, tremolo is still among the most used guitar effects. Its simple nature lends it well to broad use as it is not expensive to make, and the impact it has on any piece of music is pretty significant. We chose what we consider to be the best tremolo pedals available at the moment. There’s eight of them and each one brings its own twist to this old effect. We can say with certainty that these are among the essential effect pedals in general. With that said let’s jump right in and see what these pedals are capable of. One of the most outstanding tremolo pedals designed by legendary Robert Keeley. Small box that packs a lot of heat, controls and awesome features. 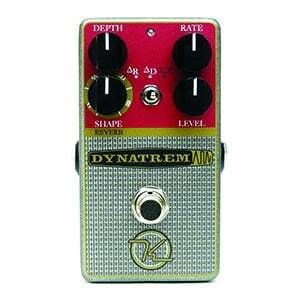 Unusual pedal that delivers one of the best vintage trem effects available. Great boutique model that offers a wild card feature and robust performance. By far one of the most capable and versatile trem pedals available. Awesome model that brings a unique features combined with impressive core performance. Affordable trem pedal that delivers an all-around solid performance and reliability. One of the most balanced boutique models that come at reasonable price. The first pedal we want to show you is a very delicate boutique tremolo that offers a bit of an advanced effect to the table. Keeley obviously took inspiration from older tech designs when they created this pedal. A simple way to describe its appearance would be to say that it looks like a vintage portable radio more than anything else. In terms of functionality, things get a lot more interesting and modern. Most standard tremolo pedals allow you to adjust the Depth and Speed of the effect. However, KDYNA is capable of adapting the both of these parameters to the speed of your playing. But wait, there’s more. This awesome pedal also allows you to infuse a bit of reverb into the signal, giving the whole package a very complete sound that can instantly transform your tone into whole new aesthetic. On top of that, Keeley introduces new ways of reducing noise and interference that is among the most common issues tremolo pedals have in general. This trem stompbox is truly one of the best at the moment. You can leave it to Wampler to completely surprise us with an awesome tremolo pedal that is full of features and controls which you don’t see that often. This is a model that is perfect for those who need to be able to fine-tune every aspect of their tone. Latitude Tremolo comes in a wide enclosure, which is reasonable considering all the knobs they’ve had to fit on it, and features a clean white color with vintage labels. Even though appearances are not crucial when ti comes to guitar effects pedals, this is a rare occasion where we’d easily frame this thing and hang it on the wall. In terms of performance, the situation is even better. Lots of range is basically what defines the Latitude Tremolo. You can dial in just about any type of tremolo effect you could think of. Older, smoother trem effect? No problem. Sharper, modern chopper? It can get you that as well. Being versatile in terms of its core function is not the only thing this pedal has to offer. You also get a tap tempo feature, true bypass, ability to choose waveforms as well as fixed tempos. It’s hard to pinpoint just how capable this pedal is. Fulltone is one of those companies who you can trust with vintage effect designs. 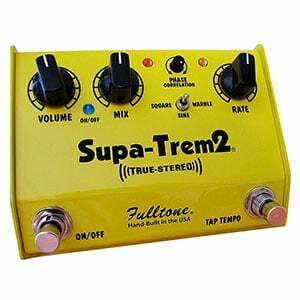 Their Custom Shop Supa-Trem2 brings the type of performance that only a vintage amp could. All things considered, this is one of the strangest looking pedals you will ever see, period. Fulltone obviously wanted to accentuate the vintage nature of their tremolo effect by designing an enclosure that closely encapsulates that type of aesthetic. It’s a wide body pedal with an angled surface where all of the controls are, and a small flat portion where you can find the on/off foot switch and the tap tempo switch. In terms of controls, it’s not the most complicated thing out there, but it does allow you to dial in a reasonable range of juicy tremolo effects What really makes this one special is the fact that Fulltone replicated the original vintage circuitry you could find in amps back then, which results in you having access to the most authentic type of tremolo you can ask for. 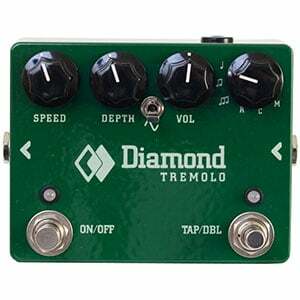 If for whatever reason you find regular tremolos to be too boring and average, Diamond Pedals Tremolo is one pedal that will give you a very different type of experience. For the most part, it looks like Diamond Pedals wanted to induce chaos into the world of tremolo, which is definitely made apparent by one of the available modes that are labeled ‘Chaotic’. Before we get to that, we need to go over the design of the pedal. It’s a wide body model that isn’t all that attractive at all. It feels like Diamond Pedals applied a more utilitarian approach when they designed this model, which is definitely something we can appreciate. However, those who like to look at their pedals as much as they like to play them might find this to be borderline unacceptable. In terms of functions, there’s plenty of whacky features to use. You get to choose different waveforms, timing accents, and of course, that chaotic mode. When that is selected, the pedal randomizes just about every parameter. Effects pedals are not something Seymour Duncan is usually associated with. However, they do have a small but powerful line of different effects, which just so happen to be awesome. The one we are looking at today is their Seymour Duncan ShapeShifter. The pedal looks flashy, and that is exactly how it performs as well. Seymour Duncan wanted to provide a more flexible solution that isn’t just rich in range, but also integrity. The body of this unit is pretty practical in terms of its dimensions, and its purple graphic theme sure looks nice on any pedalboard. When it comes to performance, you are being introduced to a world of tremolo that takes you through the history of this effect. There are many different modes to choose from, including some vintage, some modern variants, and everything in between. Seymour Duncan ShapeShifter is definitely not a conservative model, but it has a lot of that old school vibe going.Speaking of vibes, Seymour Duncan ShapeShifter is often mistaken for a vibrato pedal, which it definitely isn’t. If you’d like to see the difference, check out some of the more popular vibrato pedals. If you are familiar with Red Witch effects pedals, you know they have a very unique theme going. You could probably even say it’s paranormal in nature. In some cases, this attribute doesn’t only apply to the appearance of their pedals, but to their performance as well. 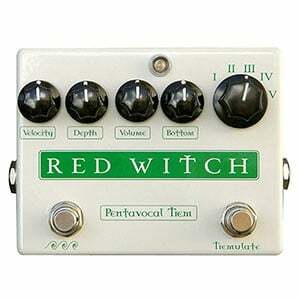 Red Witch Pentavocal Tremolo is a somewhat unique tremolo pedal that offers control in ways that you just don’t see elsewhere. The enclosure is their standard stuff – a wide unit with simple graphical design and rather ominous presence. Performance wise, Red Witch Pentavocal Tremolo delivers a great vintage tremolo as its default setting. Once you start messing with different parameters, you can wander off to many directions. Some will be familiar, while others will be completely new territory for most guitar players. This unique nature alone makes it worth checking out, but its great performance seals the deal. Anyone who has used electric guitars to any relevant extent is familiar with Boss pedals. Let’s face it, they are the cornerstone of modern guitar effects. This is not an overstatement no matter how much some people would like it to be. Boss simply has the ability to produce quality pedals that get you a decent performance at a price that is often too attractive to ignore. Boss Audio TR2 Tremolo Pedal is one such unit that brings you baseline tremolo with a bit extra on the top. The enclosure is going to be familiar to anyone who has ever seen any of their models. It’s simple, it’s practical, it works. Controls are simple as well. This is basically a vintage tremolo repacked in a modern configuration with an additional wave select knob. If you are looking for a no-nonsense affordable tremolo pedal that will get the job done when you need it to, Boss Audio TR2 is a perfect choice. Voodoo Lab is among one of the most respected boutique shops. They’ve earned this reputation by delivering rock solid pedals which bring just enough uniqueness to the table. 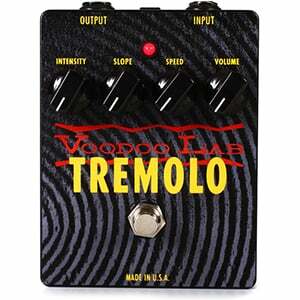 Voodoo Lab Tremolo is their take on the old school vintage tremolo. This pedal comes with a wider body that sports a lively graphic theme. Once you pop the cover, you will see that standard lamp and photocell circuitry that was the basis for all tremolo effects back in the day. As you can imagine, the performance of this pedal is going to be very conservative. In this case, that’s a big plus because Voodoo Labs has managed to reach the necessary level of authenticity. This is the type of tremolo pedal you wouldn’t mind hooking up to a top tier guitar rig, and use it on stage. The best thing about it, the price tag that comes with this tremolo is more than reasonable considering it’s a boutique piece. Tremolo effect is among the simplest and oldest guitar effects you can find. The whole idea behind it is based on volume regulation. The circuitry reduces and brings back the intensity of your guitar’s signal, which something you could achieve by rolling the volume knob really fast. Since that is not practical, tremolo pedals are an awesome way to achieve that effect with consistency. Most vintage tremolo pedals will allow you to choose the frequency of the effect and the depth of the dips. Playing around with these two controls will get you a wide spectrum of effects. Modern tremolos come with a lot more control available, and you can adjust things such as the wave form of the signal, and much more. Tremolos used to be the stars of guitar effects back in the days when we didn’t have that many effects to choose from. One question that keeps popping up whenever tremolos are discussed is whether or not this effect is still relevant or practical? The answer is a solid yes. Just because it is a simple effect doesn’t mean that tremolos have been phased out by more modern modulation pedals. In fact, they are now more relevant than ever. If you take a closer look, you will see that trem pedals are used in just about every genre of music. Manipulating volume over specified time intervals is still a rather good way to add some flavor to one’s tone. Those who are just starting to build their pedal boards can definitely benefit from choosing tremolo pedals as one of their first modulation pieces. With that said, it is highly recommended that you do not take the simplicity of this pedal for granted. There is actually a lot to using a tremolo than it first meets the eye. Lets talk about that for a moment. How to properly use a tremolo pedal? This isn’t a question that has one answer, that is for sure. There are several schools of thought on this, but it ultimately comes down to how good you can read what the song needs. The first thing one needs to understand is that tremolo fatigue is real. What that means is that you can very easily go overboard with tremolo and completely ruin the song. Too much of that leads to you being sick and tired of tremolo as a whole. The best way to prevent this from happening is to take things slow and start with very small values. Tremolos are generally used the same way as vibratos. The idea is to find appreciation for subtle amounts of both of these effects, which ultimately leads to them becoming a valuable piece of kit. Now that we have explained tremolo fatigue, lets look at what each control does. Every tremolo pedal has rate and depth controls. Some have more than this, but even the most basic tremolo will come with rate and depth. Rate is what defines the frequency of tremolo. In other words, how many of those volume changes you are going to get in a determined amount of time. Different music genres benefit from different rate values. Sometimes it is best to use a slow rate to achieve the best results, while other times faster rate is the way to go. One thing to remember is that rate requires some fine tuning. Whether you are going fast or slow, your rate value should match the tempo of the song you are playing. This way you will achieve perfect sync between the effect and your particular track. Depth or intensity is a control that determines how much the volume is going to be reduced for every dip in the frequency. Lower depth values yield a much more subtle effect while higher values tend to be dramatic. There isn’t a specific rule to be followed when dealing with depth as it is purely situational. Basically, you have to read the song right in order to figure out what kind of depth fits in best. While depth and rate are the most basic controls you will encounter, many pedals offer much more than that. For example, one of the more popular controls is the wave control. This knob allows you to change the nature of the wave. Most often it offers the choice of going with a standard sine wave or a square wave. Sometimes there are more options than that. Attack is also a fairly popular feature. This knob is what you use to alter the timing of the attack. Being one of the oldest guitar effects in use, it is only natural for tremolo to have an analog form. These pedals generally tend to be simple although there are plenty models out there which are anything but. We have even included a couple of them in our top list above. Analog works great for tremolo because of the nature of the pedal. When all you have to do is manipulate the volume of the tone, you don’t really need a very complicated analog circuit to begin with. Analog pedals also bring that organic sound which many guitar players appreciate. On the other hand we have digital tremolos. These are generally more affordable and often come with more aggressive features. Of course, this isn’t really a rule but rather a pattern. There are some pretty impressive digital tremolos that can take on any analog model and come ahead out the other end. Choosing a tremolo pedal is fairly easy once you have defined the basics. What kind of tremolo do you need? Does it have to be full of advanced features or will the basic stuff do just fine? What kind of budget are you working with? Things like that are what will help you in your search. Overall, getting familiar with a tremolo effect doesn’t even require a dedicated pedal. Much like in the old days, many current modeling amps come with built in tremolo effects. Whether or not these effects are on par with standalone pedals is questionable at best. However, you are still getting a usable version of the effect. If nothing else, you can use the on board tremolo to familiarize yourself with the effect and figure out whether or not you want a standalone pedal. These basic built in tremolos can also tell you what kind of features you will need. Some people like to jump into the more advanced models right away while others are fairly content with basic tremolo pedals. Aside from being so simple and easy to use, tremolo pedals are very versatile. You can do a lot to your tone simply by including one of these pedals in your signal chain. How complex the pedal will be, and how much control you will have access to is going to depend on your own requirements. Most guitar players are satisfied with the most basic configuration that includes the Speed and Depth controls. However, when you go above that level, you start to explore the new side of tremolos. These advanced model are very exciting to use as each one brings something new to the table. The ones we have presented you with are definitely not your run of the mill pedals. Most of these are boutique models that have a character of their own. The reason why we decided to populate our list with these pedals instead of more basic ones is that a basic tremolo can only get you so far. Besides, that Boss unit pretty much takes care of that type of tremolo effect. Whichever of these you decide to try out, chances are you will get the performance you were looking for. I had my heart set on the Carl Martin tremelo, but there is much food for thought here, thanks. How about doing famous players sounds and how to achieve them.